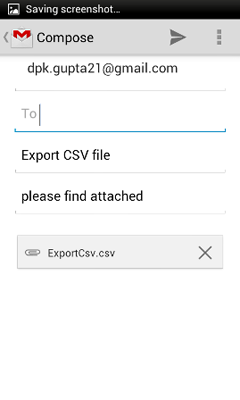 Export Addresses is a free app to send your contact details in a universal format to your mail or review on your device.This app easily fetch your contacts and generates a pdf file for your use and generate .csv file to import contacts in google contacts. 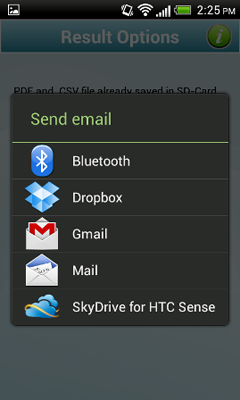 You can send these files by mail, skype and bluetooth at your desired device. • No need to sync with any server. • You can easily check your contacts. 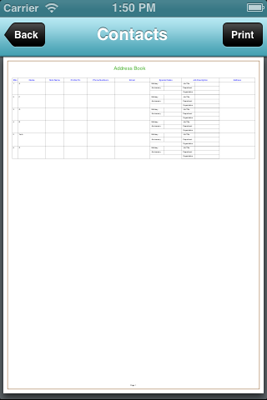 • All contacts shown in a simple tabular form that is easy to understand. • This app also take contact's photo . • Provides the Functionalities to select the contacts whose data is required. • Provides the Functionalities to select the fields whose data is required. • Generate Pdf and .csv file will save in external memory or SD-card. • With the help of .csv file we can import contacts in google contacts which contains Name, Mobile, Contact no., Email-Address. 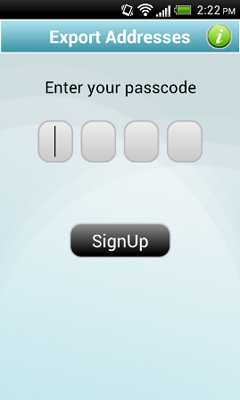 • Pass code can be setted up in settings for enhanced security. User can export its contact with name, nick name, profile pic, phone no. User can on.off or change password for application. After export contact as pdf user can mail to their mail box. After export user can view contacts ina pdf format. 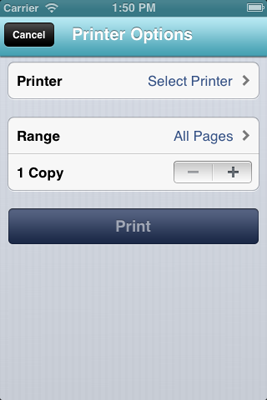 If user have configured printer, then he can give command to print exported data. 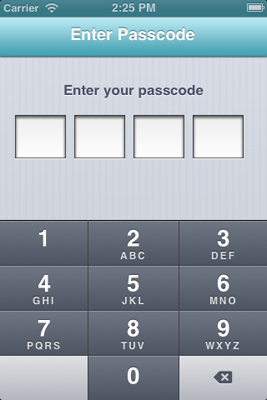 Passcode lock screen ask user for passcode if user set it. 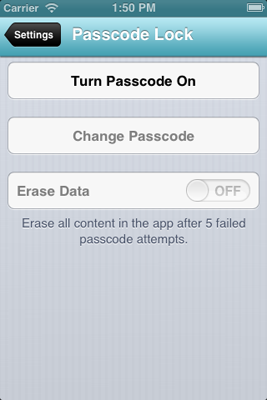 Passcode lock ask user to set passcode for export address. User can selct contacts for export of its different account such as phone, sim or google account. 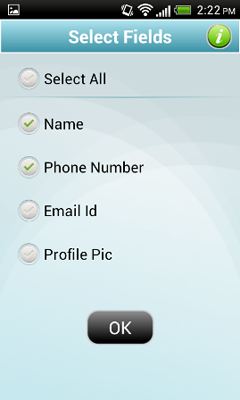 User can select field options of contact such as name, phone number, profiel pic and email id for export. 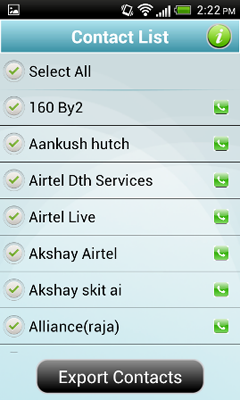 User can export selected or all contacts from contact list option. 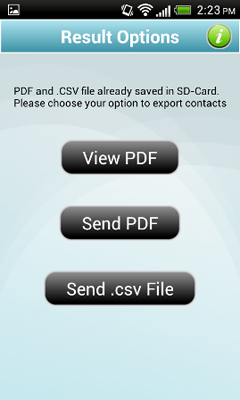 When user selects export contacts, it finds option to export them in view pdf, send pdf and send .csv file format. User can mail contacts export in .csv format to any mailbox. User can send exported contacts via different methods such as bluetooth, dropbox, gmail, mail etc. 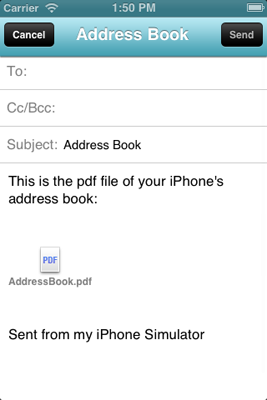 User can send exported contacts in pdf format via email to their mailbox. 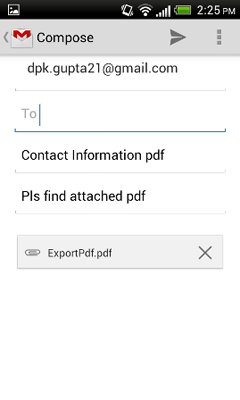 User can send exported contacts in pdf format..